Corsair has enjoyed considerable success in the mechanical keyboard market for some years now, often being first to market with new features, design choices, and switch types that later become the norm. The quest for new features is not over yet, and lately we’ve seen keyboards start to implement a level of protection against dust and water ingress by obtaining an Ingress Protection (IP) rating. The first to cross our desk was the Tesoro Gram SE Spectrum, although Corsair’s original K68 came out earlier last year, and we also have the latest Razer BlackWidow Ultimate due for review soon too. It won’t take a genius to guess that the K68 RGB adds per-key RGB backlighting to the original K68 design, which was single-colour only. As ever, Corsair continues to use Cherry MX switches exclusively throughout its mechanical keyboards. With the K68 RGB, it uses the popular Red variety (linear and light) of the Cherry MX RGB switch; no alternatives are offered. 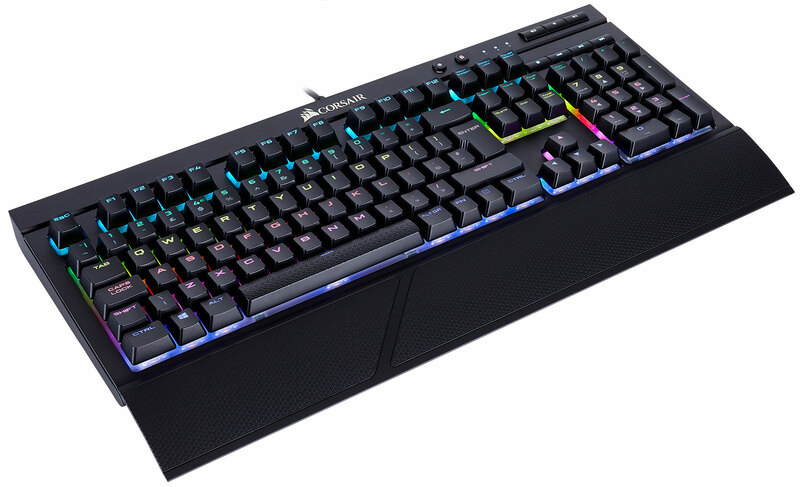 As well as offering per-key RGB backlighting, the K68 RGB is fully programmable via the Corsair Utility Engine (CUE) software that’s also responsible for the lighting, meaning you can program in custom functions and macros to your heart’s content. While something of a standard now, it’s also worth mentioning that the K68 RGB has 100 percent anti-ghosting and full-key rollover as well. Clearly, then, it’s yet another Corsair keyboard with an extensive feature set, so the £140 price tag is hardly surprising. The entire outer body of this keyboard is a matt plastic, but this belies its strength, as the K68 RGB is exceptionally rigid and certainly feels like it has internal reinforcement. Corsair usually doesn’t let us down when it comes to build quality, and this is no different. Making connection via a single USB cable, the K68 RGB has no pass-through ports of any kind (unsurprising, since this would likely impact the ability to offer water resistance). That said, the cable cannot be removed, so you might have to fumble a little longer in order to disconnect the keyboard in the event of liquid spillage. On that note, it’s important to remember that water-resistant is not the same as waterproof (same for dust). The IP rating can give us an indication of what to expect here; the K68 RGB has IP32 credentials. The second digit is the relevant one for liquids, and as you can see here this means: 'Vertically dripping water shall have no harmful effect when the enclosure is tilted at an angle up to 15° from its normal position.' Essentially, this keyboard should suffer less damage than others in the event of a spill, but it isn't considered waterproof. Unless you have a leaky ceiling, vertically dripping water doesn't seem very likely for most gamers; if anything, a spill is likely to come from a nearby beverage, which would probably qualify as spraying or splashing under IP guidelines and involve angles greater than 15°, which calls into question how effective the K68 RGB will be in real use. By comparison, the Razer BlackWidow Ultimate has an IP54 rating for protection against splashing water from any direction, while the Tesoro Gram SE Spectrum has an IP56 rating, which means protection from water even when sprayed from powerful jets. Corsair's means of protecting the components involves a large, translucent rubber silicone sheet fitted above the PCB. Where it meets the switches, it surrounds them on all sides such that the top of the rubber is always below the bottom of the external keycap, which thus acts as a something of a protective roof for the switches inside. The keycaps on the K68 RGB are larger than usual too, at least on the typing surface – the base dimensions and plunger position are standard. Thus, the keycaps should direct water down onto the rubber, but if it splashes down with enough force it could rebound up under the keycap and down into the switch. The K68 RGB also has internal channels and drain holes to help clear water out in the event of a spillage. The only thing missing is a keycap puller; if you do end up having to clean and dry the keyboard, not having one will likely prove frustrating. As well as the larger typing surface on these keycaps, Corsair continues to use an enlarged (and also textured in this case) spacebar, which forces a reduction in size of some of the bottom-row keycaps compared to regular designs. It has also opted for a bold font that’s likely to divide opinion. Symbols typically occupy the top half of the keycaps so as to receive the most light from the RGB LED below, but the clear switches and white rubber layer do help to reflect light around and ensure that secondary lower symbols are not devoid of light. Along the top, you’ll find dedicated keys for controlling brightness (three levels and off) and locking the Windows key. Dedicated backlit media keys are also included and cover all the normal functions. I’ve always liked these, although I do miss the metal volume wheel from other Corsair designs. The FN key, meanwhile, can be used with the number row to change the lighting effect and also the arrow keys to change the direction, speed, and duration of said effects where applicable. These are the only plug and play functions of the K68 RGB, as it doesn’t support storage of onboard profiles – all other custom lighting effects and functions require software. The rubber base doesn’t interfere with the typing action of the Cherry MX RGB Red switches, which remain as crisp and consistent as ever. One side effect, however, is that it is a quieter than normal keyboard, especially if you bottom-out the switches regularly. The keyboard has plenty of rubber to grip whatever surface you’re using it on, and the flick-out feet at the back that increase the typing angle are also rubber-tipped. Corsair also includes a clip-on, soft-touch, textured wrist rest. While this is large enough to provide a decent level of support, I’m not convinced by the texture and found it to be irritating and ticklish when resting or moving against it. The clip-on mechanism is at least simple to use and effective.